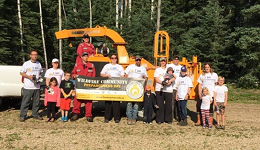 Applications for Wildfire Community Preparedness Day 2019 are now open! Apply for your chance to receive $500 to put towards a FireSmart activity or event in your community! Hold a FireSmart information session with your neighbours. Reach out to your local fire department and invite them to introduce FireSmart to community members. Ask each resident to make one FireSmart commitment and then hold a follow up meeting to see how everyone is doing! Hold a FireSmart work bee – invite local residents to roll up their sleeves and clean up dead and downed woody debris surrounding the community. Hold a FireSmart chipping event – invite local residents clean up vegetation on their properties and haul it to the end of their driveway for pick up and chipping. Invite the local fire department to come and help conduct FireSmart structure and site hazard assessments. Ask residents to commit to one action item on their property and then hold a contest with a prize to the most active community member. Work collectively with your neighbours to make sure that every house in your neighbourhood have eaves that are clean and free of debris! Celebrate these activities with a community BBQ after! Application deadline is March 9, 2019. Get your applications prepared before the deadline passes!